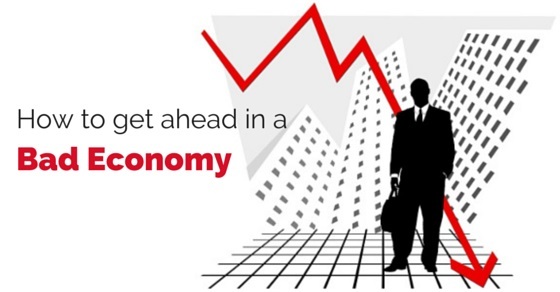 Bad economy is bad news for everyone, be it employers or employees. Bad economy often means lesser job opportunities and hence more competition for the jobs available. That means many remain empty-handed after job searches or those who are stuck in a mundane job they don’t enjoy, do not have the courage to leave it. But at the same time, statistics and reports have shown that people who are really smart and super efficient, do get job offers, yes, in plural, even during bad economy. There are many instances of efficient candidates landing his or her dream job even when the economy has been disappointing. That means you too can get a stance to get ahead in a bad economy if you can add to your traits, remove some negative ones and remain charged up. This is a mantra that works for all, business owners, big and small, employees, and generally all those who have to work for a livelihood. If you think your current boss is not valuing you much and you are afraid of being chucked out citing bad economy as a reason, then get up and smell the coffee. Find why there is the dissatisfaction and find ways to improve your performance at work. In a bad economy, hard work is needed and it will alone help you in the longer run. So, find out what’s missing and work on it. In all kinds of economy, blooming or bad, hard working and outstanding candidates will always be valued. Do an overhaul and pay attention to details. Be punctual or even arriving early at work to complete last day’s work or to take up projects early on, can help for sure. Ask for challenging work and try all means to excel and constantly do an evaluation of sorts with your manager to guide you what you lack and what you need to learn. When you try and succeed at being an outstanding employee, it is not just your current employers who will value you, the news will also spread outside, that means, there will be options waiting for you, bad economy or not. Even if you are assured that your job is safe, do not be laidback because it is the laidback persons who get the hammer first, generally. Show curiosity in what is happening at your workplace and if there are events, workshops, conferences that your company is organizing and even if they mean hard work, attend these events because these are the places you get to network and meet other people, who can be of help in future. At the same time, by being a constant presence at company events, you are also able to safeguard your positing in the current job. While most of us are pretty good at selling or promoting things that we believe in, when it comes to self-marketing, most of us fail. If you wish to stay ahead in a bad economy, then you should be able to sell the product named ‘you’. Prepare well and state in brief words about your contribution and achievements and also use this brief to get a new assignment and even new jobs. Achievers don’t have to scout much for opportunities as doors come to them. So, be an achiever and do not be shy to say what you have achieved. In a bad economy, compromises and adjustments are needed often. If you succeed in getting a job and if you feel that the new job is a place where you will be able to learn new things and that it will help you progress professionally, then do not hesitate to take a pay cut in the initial phases. Those who are good at their work will get their due and get a post and compensation that match their calibre. Hence, be confident about yourself and get ahead. Do not be disheartened and don’t stop looking for a job, thinking it is a bad economy and there are no jobs out there. Go after your dream job and do everything that it takes to get it. Send resumes everywhere, meet people, and send word out. It will take efforts and good investment of time for job search, but go about it aggressively and you will sure land up your dream job sooner or later. Once you get the job, do everything to sustain it and what you will need are hard work, efficiency, the urge to learn, punctuality, honesty, standing up to challenges and enthusiasm. Possession of team spirit is the sure shot way to be ahead everywhere and at all times, especially during bad economy. Team spirit means that you are not just thinking of yourself but even those around you. You are thinking of the organization and you understand that whatever you do to excel your position and job, will also help the organization and the team. Be enthusiastic and show keen interest in your job. When you will put in your 100 per cent and you regard your work as your passion, you will be able to be a better employee and the job will also love you back. Every company likes an enthusiastic guy in their office. Enthusiasm and passion are the two key words to get your dream job and also to excel in it. Leadership skills have to be cultivated. It is all about putting a step forward and standing up. Ask for projects and if there is any coming up, request your managers to consider you. When there is any activity, that needs betterment or if you know how to do a task better, no matter, if it comes in your job profile or not, volunteer to help out. These tasks may not get you on-the-spot-increment or praises, but be assured that you are noticed and these skills will definitely help you in the long run. Never treat yourself casually and do not allow anyone to do so, that’s definitely a piece of advice to stay ahead in a bad economy. Usually, when someone compliments us, our reaction is, ‘Oh, that’s no big deal’. But in times of a weak economy, when everyone’s trying to be a notch higher, you have to be seen where you are being complimented for your work, you have to stand up and be vision. So, accept the compliments graciously and do say that since you have put up lots of efforts and hard work, you definitely deserve the compliment. During a bad economy, be it for getting a new job or to be counted in at the current one, there is only one way – brush yourself up. Since skills are what count, sign up for on-training workshops and programs or take up courses that will help you in your current job. Never quit learning and that’s one quality that will keep you ahead of the rest. An uncertain and bad economy often brings upon organizational restructures and so on. The only way to stay ahead in such a circumstance is to accept changes and move forward. Your workload may increase, you may be asked to take a pay cut or you may be asked to shift to a new office, whatever is being asked of it, as long as you can accept them, say yes. Your perseverance will pay off, be confident. Always keep your eyes and ears open for new opportunities. Take things positively. If you are asked to take up more work, see it as an opportunity to move ahead in your profession rather than as something that will tire you. Understand, whatever you will learn or imbibe will never go waste and it will always help you in future. You might have to work harder but tomorrow will reap in fruits, for sure. Sometimes, things may not be bad as they seem. Especially in matters such as a bad economy, media often overdoes it and they send others into a frenzy who hit a panic button. In a bad economy, you will hear many rumours, you are going to lose your job or there are no jobs out there or you will get work but no salary and so on. Do not let these deterrents dishearten you. Be best at your work and if you are looking for a job, do your best there too. This is one strategy that helps in all situations, professionally and personally. One can easily lose his head when there is so much lay off, pay cut and downsizing happening but ignoring them is the best policy. Do not worry yourself much but focus on your work and try to put in your best. Que sera sera, so keep a cool attitude, and stop stressing. Smile for yourself, to yourself and at others. It is said a smile can even win opponents, that means it also has the ability to bring the best in you and also bring in good fortunes. So, smile away. While a bad economy will end its run on its own, one can’t predict an actual date. We can’t stop living because the economy is not doing well. The above factors will help you face tough situations and thus keep you ahead of others. The best thing about the 15 points above is that they will help be the best in whatever you are, no matter how good or bad the economy or circumstance is.